Painted votive tavolette are a key feature of a new temporary exhibition entitled Madonnas and Miracles: The Holy Home in Renaissance Italy, which runs from 7th March – 4th June 2017 at the Fitzwilliam Museum in Cambridge. We spoke to Dr Mary Laven, co-curator of the exhibition and Reader in Early Modern History at the University of Cambridge, about the role that votive offerings play in this exhibition. Hello Mary, thank you for taking the time to have this conversation for The Votives Project website. Perhaps we could start by talking about how this exhibition came about? The exhibition arises from a four-year ‘Synergy’ project funded by the European Research Council, entitled ‘Domestic Devotions: The Place of Piety in the Italian Renaissance Home.’ It’s an interdisciplinary enterprise, that builds bridges between History, History of Art and Italian Studies and, from the outset, we thought that it would be really revealing to bring together books, material objects and a wide range of images in a single multi-media exhibition. We are so grateful to staff at the Fitzwilliam Museum for agreeing to host us and for embracing the exhibition with such enthusiasm. Could you give us an idea of the range of objects that visitors are going to see in the exhibition? Most of the objects on display would once have been located in the home. For example, little dishes with saints or crucifixes painted on them, a comb that depicts the Annunciation, storage boxes decorated with biblical scenes, a kneeling stool for prayer, and many, many small devotional items, such as rosaries or crosses. We’ve also brought together a wonderful array of printed matter, from finely bound books to tattered sheets of paper bearing the words of a protective prayer or an image of the Virgin Mary. And of course there are also some beautiful paintings and sculptures on display. Was it hard to narrow down the selection of objects? Were there particular objects (or types of object) that you knew you absolutely had to include? Funny you should ask that … it was the votives that we really viewed as essential to the show. Could you give us some general background to ex-votos in Italy in this period? How much do we know how they were commissioned and made? And how far can we reconstruct devotional practices involving votives? The votives come from three shrines, from three different parts of Italy: Lonigo, between Padua and Vicenza; Tolentino in the Marche and Madonna dell’Arco, near Naples. They are painted wooden boards, mostly orientated in landscape and around a foot in width. Votive tablets of this kind first emerged in Italy towards the end of the fifteenth century. We don’t know much about who made them, but we can surmise that they were sometimes serially produced by workshops that existed close to pilgrim shrines and at other times produced to order by painters, who might also be engaged in various other kinds of artistic production. Votive tablets tell us a a great deal about Renaissance devotion, both because they are themselves a material record of a devotional practice (an offering left at a shrine to give thanks to the Virgin Mary or another saint for intervening on the donor’s behalf) and also because they depict individuals and families at crisis moments, often brandishing their rosaries and appealing to the saints. How did you make your choice of individual ex-votos? Was it difficult to arrange the loans, given that these are all functioning Catholic shrines? It’s been a real labour of love securing the loans of the votive tablets from Italy. We’ve been treated with nothing but kindness and cooperation by everyone we’ve dealt in North, Central and Southern Italy, but this is a country that likes to wield red tape and there were moments when we were really concerned that not all the stamps and signatures would be in place in time for the exhibition. We’ve picked tablets that play to the themes of our exhibition: images of families at prayer, children in danger, houses collapsing during earthquakes and scenes of quiet domestic devotion. We are aware that these images will mean different things to different people. For some, the image of a girl falling headfirst into a wine vat may seem comic. For others, representations of families gathered around sickbeds will spark more personal memories. Do you notice any regional variation in the votive material from these three sanctuaries? We’ve arranged the votives on the wall in three sections, representing the three different shrines. Several people have commented on the colour of the bedspreads depicted in images from Lonigo (green), Tolentino (red) and Naples (white): the colours of the Italian flag, as it happens. The votives from Lonigo and Naples both celebrate the miracles of the Madonna, while those from Tolentino record the interventions of a male saint, Nicholas. We’re pleased that the tablets aren’t covered up by glass and we hope that the crowded wall of images will evoke something of their original display in Renaissance churches. The focus of the exhibition is devotional practices in the Renaissance home. What do the ex-votos tell us about this theme of ‘home’? Renaissance ex-votos provide visual records of individuals and families in crisis and crises often occur at home. This is why there is such a preponderance of tablets depicting sick-rooms, as well as representations of household accidents, often involving children. This focus on the domestic coincides with a trend in contemporary miracle literature – which poured off the presses from the late fifteenth century. Compilations of miracle stories, often produced by the religious orders that looked after shrines, were among the best-sellers of the Renaissance. But the recurrent accounts of acute infant illness or children falling out of windows or into fires can make for stressful reading for anxious parents. Do you have a favourite votive object in the exhibition? Could you describe it for us? One of the most poignant images is of a family praying in their house while all around them the town crumbles during an acute earthquake. This votive is lent to us by the Basilica of St Nicholas at Tolentino, where 10,000 residents were forced to leave their homes this autumn and many buildings have either collapsed or been demolished. Thank you very much, Mary, for giving us these fascinating insights into the exhibition. 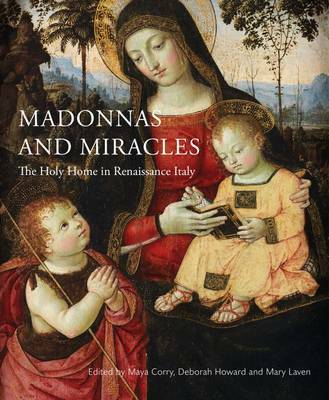 ‘Madonnas and Miracles: The Holy Home in Renaissance Italy’ is showing at the Fitzwilliam Museum in Cambridge from 7th March – 4th June 2017. To read about the research underpinning the exhibition, visit the ‘Domestic Devotions’ project website. And you can read a longer article by Dr Mary Laven about the votives from the sanctuary of the Madonna dell’Arco sanctuary near Naples here: ‘Recording Miracles in Renaissance Italy’. March 2, 2017 in Exhibitions. ← When is a womb not a womb?